They look and sound amazing! Earphones come with small, medium, and large silicone tips! Do you ever feel like Mary Poppins when you’re looking for your headphones in your bag? You’re pulling out lamps and folding furniture, but feel like you need a ladder to get to the darn things at the bottom of the bag. Well, with the Wraps Classic headphones, those days are behind you, because you can carry these headphones on your wrist! 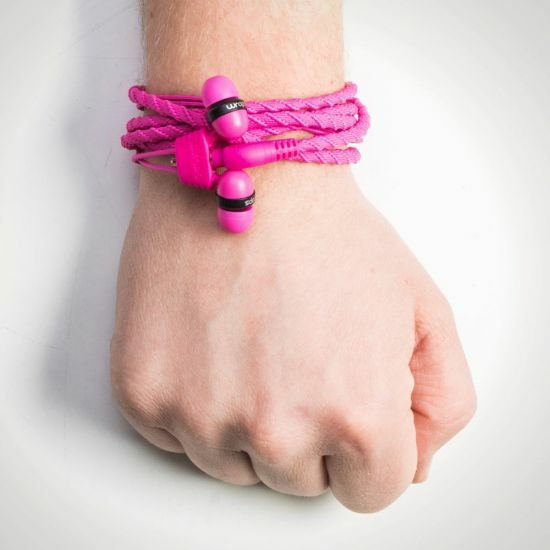 Yep, these headphones wrap around your wrist and attach with a patented design to create a fashionable pink bracelet made of woven fabric. OK, after that mouthful it’s time for an earful… of great music delivered via the headphones’ 10mm dynamic speakers and gold-plated jack. Oh, and because only waiters need big tips, these headphones come with silicone tips in 3 sizes: small, medium, and large! Leave the scary nether-regions of your bag undisturbed and carry your headphones right on your wrist with these Classic Wraps headphones in pink!